Account creation is made via a request to Community Development, who will provide the information to Web Development. This web space is intended for student clubs and organizations to create and maintain a web presence. Examples include the Student Government Association, Student Organizations at the Law School, and the Slavic Club. Before requesting a space, each student organization is required to register with Community Development, which maintains an official listing of clubs and organizations on their official website. The official listing contains the club or organization name, its officers, faculty advisor(s) and basic contact information. The Community Development webpage then offers the student club or organization the ability to link to another resource for more information. They can choose to link to the club or organization's national presence, a University hosted blog, a Facebook or MySpace presence or a website on this server. 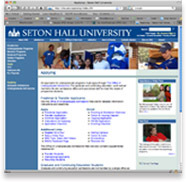 The websites contained on shulife.shu.edu will expire on an annual basis with registration required with Community Development to keep the pages active and accessible. Courses in Web Development and the use of Microsoft's Expression Web are offered through the CTC on a regular basis. Please review their website for information. Any user not wishing to use the University-provided software may use the web development software and SFTP client of their choice. TThe communication protocol supported on shulife.shu.edu is SFTP only, the server is accessible both on and off campus and is not crawled by major search engines. Authentication is set via the University's account management services.